SINCE THE RISE of Brussels as a political power centre over the last two decades, corporate lobbies have colonised large parts of the Belgian capital’s European district, home to the EU institutions. Estimates of the number of lobbyists in Brussels range from 20-30,000 people working the corridors of policy-making, the vast majority for business associations and corporations. 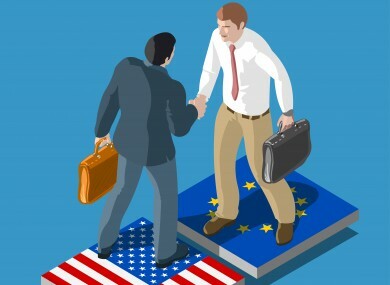 Currently, the focal point for corporate lobbying is the Transatlantic Trade and Investment Partnership (TTIP), a proposed EU-US trade deal covering a wide range of policy areas, from banking to pharmaceuticals regulation, data protection rules to pesticides. The “Investor-State Dispute Settlement” (ISDS) chapter of TTIP is of grave concern and captured significant public attention during 2015. Under ISDS, corporations will acquire legal rights to challenge democratic decisions when they consider that such decisions jeopardise profits. But TTIP also involves proposals for “regulatory cooperation”. This aims to dismantle differences in regulation between the EU and US and prevent new ones from emerging. Public interest regulations – such as proposals to improve consumer rights, environmental or labour standards – would thus have to go through lengthy procedures, including vetting by business for possible impacts on trade. The yawn-inducing name is part of what makes it so dangerous. Indeed, lack of attention to regulatory cooperation in the EU-US talks has enabled those who would rather not engage in public debate on the issues to spread reassuring, inaccurate messages. EU leaders and member states, including the Irish government, sell regulatory cooperation as a way to simply cut proverbial “red tape”. But it’s much more serious than that. A report released today by Brussels-based lobby watchdog Corporate Europe Observatory (CEO) and Berlin research group LobbyControl shows that, from the beginning of transatlantic regulatory cooperation in the 1990s, the European Commission and US government have been eager to include big business at the centre of decision-making. They even helped set up the Transatlantic Business Dialogue (TABD), a club of CEOs from the biggest European and American companies, to advise officials on trade and investment issues. TABD member companies include Deutsche Bank, PWC and British American Tobacco. The TABD would become very influential over the years, and senior bureaucrats made it a habit to thoroughly consult with this business lobby group in order to frame the transatlantic agenda. In 2002, the EU adopted new rules to ensure transnational financial sector corporations no longer escaped European capital adequacy rules. US companies in the sector would thus have to be supervised in Europe, and abide by EU rules on capital requirements. This idea sent shivers down spines in Wall Street and big bankers raised the issue with the US government, who took it up with the EU. Under regulatory cooperation, dialogues were launched to align transatlantic rules. The upshot was that US banks were able to operate in the EU without significant European monitoring. When the financial crisis broke, it quickly became clear that supervisors knew very little about the European side of account books of US financial corporations. This was certainly true in the case of infamous investment bank Lehman Brothers and insurance giant AIG, whose financial products division was based in London. The conglomerate’s demise in September 2008 was a key moment in the crisis. The same process also helped to hamper action on animal testing in the 1990s, when the EU sought to ban the marketing of cosmetics tested on animals. US authorities immediately started putting pressure on the Europeans to scrap the idea, calling it a trade barrier, and threatening a complaint at the World Trade Organisation. The TABD got involved well before the proposal was even presented to any elected assembly. It made its opposition clear, saying the ban would seriously impact EU-US trade. Despite intense pressure, the European Parliament voted for the ban in 2002, condemning inappropriate interference in EU politics by the US. However, concessions were made on the timeline, so the marketing ban would only come into force in 2009, two decades after the initial decision was made. US industry had wanted the law buried entirely, but they did manage to secure a remarkable delay. Other examples included in the CEO/LobbyControl report explain how regulatory cooperation impacted data protection, rules to tackle hazardous electronic waste, ozone depleting substances and aviation emissions. Most ominously, all these scenarios unfolded when regulatory cooperation was based on voluntary guidelines within weak institutional structures. Under TTIP, all that is set to change, as the same corporate lobbyists use the talks to enshrine such procedures into the policy-making rulebook. Its advocates routinely assert that this cornerstone of TTIP will not lead to lower standards or protections – experience of regulatory cooperation tells a different story. David Lundy works for Corporate Europe Observatory, an NGO based in Brussels that works to expose and challenge the power of corporate lobbies over EU policy. Corporate Europe Observatory is a research and campaign group. Email “The yawn-inducing name of this EU-US trade deal is what makes it so dangerous”. Feedback on “The yawn-inducing name of this EU-US trade deal is what makes it so dangerous”.